Really, I am. I’m probably too easy to please, but that’s just how it is. Generally, I find that any cliches and tropes that set most YA readers off don’t really affect me as much, as long as they’re done well. That’s the kicker to this discussion: all lackadaisical reading on my part is only when the cliches/tropes are handled well. I like love triangles, I like dark and tortured male leads, I like it when the protagonist suddenly finds the power and strength inside them to take down the big bad – it just makes me so happy. And I think this is why: I read to escape. I understand that, most of the time, YA books have situations that aren’t entirely realistic. In real life, the girl doesn’t always end up with the guy, families don’t always reconcile, mental illness can’t always be dispelled permanently, and consequences really can’t be escaped. But in YA, the percentage of happy endings is a little bit higher, and it’s nice to live in that world where a single sixteen year old girl can take down an entire dystopian government (you go Katniss! Although I wouldn’t necessarily apply the word happy to Mockingjay… *eternal side-eye at Suzanne Collins*). I think the best example of this can be summed up by Meg’s review of Crash Into You by Katie McGarry a few days ago (thanks for posting at the right time, Meggy 😉 You’re the best!). I completely agree with every single point in her review – the flaws she bullet pointed are absolutely correct, and by all logic I should be turning my nose up like the YA connoisseur that I am. But you know what? I loved every bit of it. ATE IT UP. And read it more than once on top of that! Because despite the cliches and tropes and plot holes, it just worked for me. I could ignore all of it and just fall in love with the entire story and its characters. Could I call this award winning literature? Do I still like it? And in the ever-wise words of my coworker: I don’t give a flying flip. I was entertained, I felt some emotions, I flailed over some characters. If I did at least two of those three things, I’m a happy camper! Are you judgmental towards books with cliches? Can you ignore them easily? I think Free to Fall illustrates this perfectly 😉 I try not to have guilty pleasures, because really I just like what I like, but I totally agree in theory! Ughhh yes. Love triangles are either GREAT or WHAT THE HELL AM I READING. There is no middle. Totally agree with you! If an author writes so well that I ignore the little cliches, then they rock! I don’t think I’m overly judgmental of cliches when I can tell the author actually put thought into them, even if it doesn’t end up completely working for me. It’s when the cliche feels like the convenient way to go that I feel myself getting annoyed. If it doesn’t feel like they cared enough to try to take a character beyond the cliche, why should I be expected to care more while reading than they did while writing? That’s a good distinction. I can always tell when an author got lazy with the writing – and why should we spend time reading it if they don’t care enough to vary their writing? =) I get it you totally. Good writing is good writing, even if the plot is a little predictable. I too am easy to please, but I also tend to stay in the ” I like it” vs. Love OR Hate. 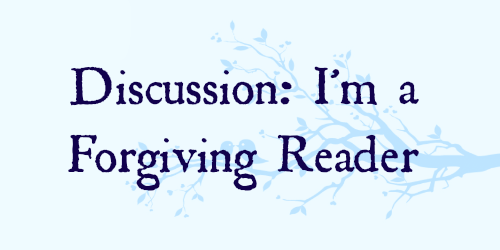 I think I’m actually in the Love OR Hate camp – most of the time I have pretty strong feelings toward a book, and the ones that I just like I tend to forget pretty quickly. I feel like I’m like this with some books, but then others I’m more critical of. I think it depends on, like you said, how well it’s done. Like obviously I freaking LOVE LOVE LOVE Crash Into You, but umm yeah it’s not super realistic haha. But I was able to forgive that because I loved the characters and the writing so much. Sometimes, if other elements in the book are amazing, it’s easy to let go of things that don’t bother you quite as much in order to fully enjoy the book and read it for what it is. I've noticed that if I get too pissed off at one element, I'm really irritable towards any of the other weird parts. I can always recommend some good ones if you need some ideas! This is me to a T! 😀 If I’m having fun reading and I mostly like the characters, I really don’t care about technical failings or cliches. I like to have fun when I read YA, and while there are certainly books that both make me feeeel and are technically awesome, there are also those that I just enjoy because I like them. I don’t think there’s a thing wrong with that, either. It’s the same reason I feel no shame in watching a lot of the stupid tv shows I watch. I enjoy them, they make me happy, so why not? 🙂 Great post Kayla!! I’m the same way with my TV shows too! That’s why I watch Spongebob and the latest episodes of Supernatural – I just like the shows, even if they get a bit funky. I think I can relate to you in that I read to escape reality as well (because real life is too boring and cruel, most of the time), but I have to admit that I’m really critical of books at the same time! You probably can tell that from my negative review of Crash Into You, which I REALLY wanted to love, believe me, but just couldn’t. 😦 So yup, I’d definitely say that I’m judgmental toward books with cliches in them. Most of the time I end up disliking a book because of cliches, but there have been times when cheesiness just makes the hopeless romantic in me giggle endlessly. P.S. ALL THEM GIFS. LOVE. I forgive you for Crash Into You though 🙂 I know it’s one of those series that it’s like to each their own sort of thing. Hit or miss I guess – I’ve read books like that too! Yeah, that’s my reading process like 90% of the time – way too goofy! Like Aimee, I’m a critical reader. I break the books I read down to the very last chemical and dissect them even more, although lately my reviews have been more general (I used to make like essays about them lol). I’m not really guilty of it as that’s just how I am. I see a cliché and I’ll ascertain whether it was used positively or negatively. In the end, it still depends how the author made use of it and how it affected me~ But also like Aimee, I also have my own guilty pleasure reads in which I just eat everything and not think about it and enjoy myself immensely in the end. There are books like that for every one of us! Pingback: Weekly Recap| Jul 13-19, 2014 | Oh, the Books! In my case, I think it really depends. If the plot is cliché but everything else comes together well, like prose, voice, pacing, etc, then I don’t really mind. After all, I also read to escape and come on, we all daydream about things we know will never happen the way we imagine them to. So I think it’s perfectly alright for a book to portray exactly that because these can be very fun and light-hearted reads. I’ll keep reading, so long as I don’t end up predicting even the tiniest details or am reduced to an eye-rolling fit because I’m faced with yet another cheerleader of sub-par intellect because seriously, there are doctors and lawyers out there who are former cheerleaders, so stereotypes like that do turn me off. Oh but I am very critical when it comes to religious and ethnic matter. If there is even the tiniest misrepresentation, I get mad, particularly when religion or ethnicity are supposed to be central to the book. Take Bestest. Ramadan. Ever. I was so peeved when the (Muslim) main character scoffed at another girl who was surprised that she could wear nail polish, then went on to call that girl ignorant. The thing is, Muslims shouldn’t wear nail polish because water can’t penetrate it, thus voiding ablution before prayers. This means the ignorant one was actually the main character. It’s a minor detail that doesn’t technically affect the plot of the book but it does have the potential to shape perceptions about what is and what isn’t permissible in Islam. I get concerned about that as well; most of my reviews are 4 or 5 stars with the occasional 3 or less stars. I just LIKE all my books and I tend to read ones that I know I’m going to enjoy. But I agree – it’s better than having review after review of low ratings! Wow, we’re even the same with our forgiving ways! I’m totally okay with cliches in books as long as they’re written well. Obviously it’s going to be a bit of a problem if a love triangle is bland and lacks chemistry, but if it’s between two characters who are both well developed and swoony, I’m totally fine with it. I only hate love triangles when they’re 1) too angsty, and 2) It’s so clear that the chick belongs with one dude over the other. Like OPEN YOUR EYES WOMAN MY GOD HE’S PERFECT FOR YOU JUST KISS AND MOVE ON OKAY?? That’s true; I actually just read a book like that. The pacing was slow and a bit, “really? Can we please move on from the angst?” but I loved all the rest that I really didn’t care! I think I tend to be forgiving also. Because, yeah, cliche or not if the author can get me to care about the characters and have a good time reading than I’m happy. I need it to be honest more than realistic. If the author does it badly, or the characters or story are inauthentic than I’ll complain about the trope, maybe. But really it’s not the trope, it’s that the author used the trope as a crutch for weak writing. But good characters and engaging emotions can offset a host of flaws in a story and I’m fine with that. I’m pretty much like you, Wifey. I can be SO OVER a trope and still fall for it hard. Like with the book I am reading at the moment. Love triangle alert! Can I even begin to express my seething hatred for the love triangle? No. But am I still rooting for the seemingly sinking ship? Yes. There’s obviously something wrong with me, because I am STILL being pulled in by these excruciating tropes and plot devices. But I can’t help it. I LIKE this character, and they are CUTE together and they just need to get away from all the CRAP and live HAPPILY EVER AFTER DAMN IT. But I agree with what you said: it has to be done well. Or there will be no reprieve from my hatred of the plot trope device thing whatever used. Like the bad boys… I mean HOW MANY ARE THERE and yet we are still head over heels. We need a bad boy anonymous meeting or something. It’s terrible(ly good).